Ah, yes, Thanksgiving... perhaps the most anxiety-filled holiday for vegans (and turkeys!) alike. It's one of those days when your vegan/vegetarian values will likely end up on display, in subtle and not-so-subtle ways. However, it's up to you to handle things in a civil, kind-hearted way - especially if you want to save the family arguments for topics like politics or Adam Lambert's recent AMA performance. Trust me, I understand that confronting a gigantic turkey on your grandma's dinner table can be a bit over-whelming, and that explaining that mashed potatoes prepared with butter and milk aren't vegan (despite the fact that potatoes are, in fact, a vegetable) can be exhausting, but don't count Thanksgiving out just yet. As many seasoned vegans/vegetarians know, Thanksgiving can be a wonderful time to celebrate your "alternative" dietary preferences. In fact, bringing a dish (or two) to pass often creates the perfect opportunity to talk about the healthly aspects of cooking without dairy, or some of the reasons that you chose to become veggie. You might even discover that you relatives have unknowingly created vegan dishes themselves (ex: green salads, rolls, steamed veggies), which is worth pointing out, simply because it helps people to understand that vegan food isn't "weird" or "scary." Along those lines, one of my favorite methods for covertly convincing people to try vegan food is to share dessert. I prefer to let people try the food first - so there are no preconceived notions - and then follow up with the fact that what they ate just happens to be free of animal products. The conversations that follow ("how in the world did you make this without eggs, milk, or butter?") are often fantastic. Really, there's nothing quite like the taste of a delicious vegan cookie to get people interested in how/why it was made that way. I don't know if I've admitted this before, but I have a serious case of tofu-phobia. I've tried tofu prepared in various ways and as an ingredient in lots of different recipes. However, I just plain don't like it (which likely makes me a very bad vegan). That being said (yes, that's a nod to Sunday's episode of Curb Your Enthusiasm), this pumpkin cheesecake - which included tofu - is pretty delicious. I enjoyed its pumpkin flavor, and how light it was, but my favorite part was truthfully the candied cranberries. (I could eat them with a spoon!) CH thought it was fantastic though, and it's likely that those of you tofu-fans out there will love it, too. Although this might not be the best bet for the tofu-weary, it would still make a great Thanksgiving treat. 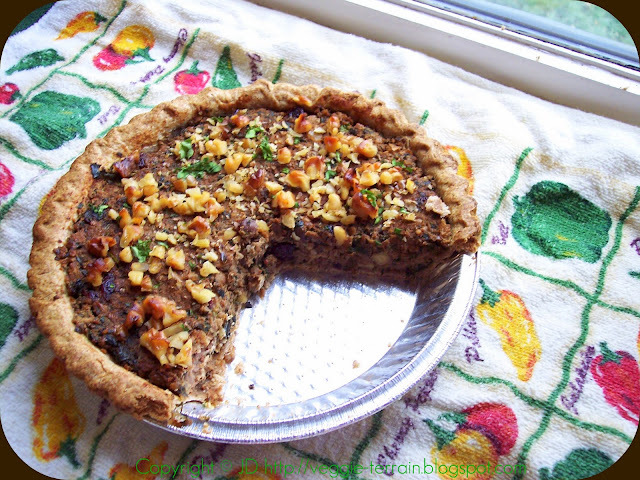 One thing's for sure - this tart tastes just like Thanksgiving! If you like stuffing or other savory foods, you'll probably love it. And although it's not quite my favorite dish, CH really enjoyed it, and I think that other carnivores would, too. 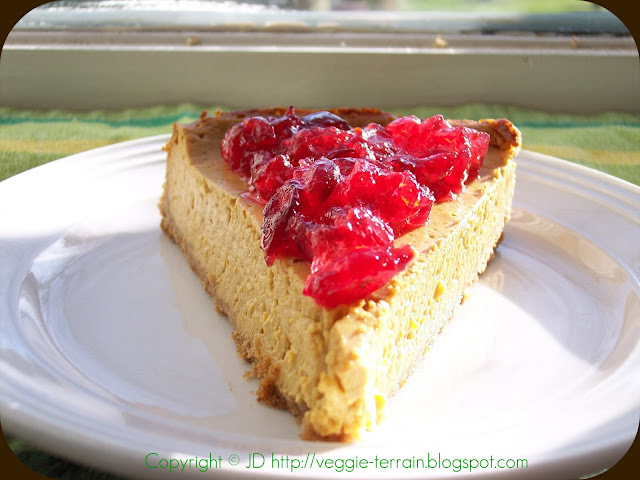 Give it a try for Thanksgiving - your family won't believe it's vegan, I promise. 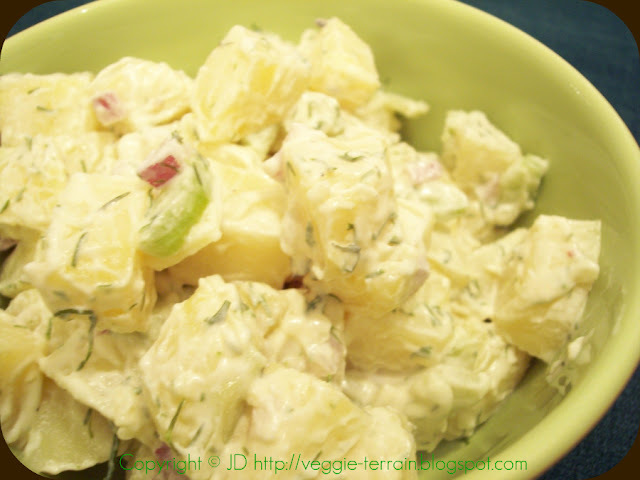 This creamy, slightly tangy potato salad is always a hit at parties and family gatherings. I love it because it's delicious, and because it allows me to showcase the wonders of Vegenaise, which is a product that always amazes non-vegans. Plus, dill and Dijon mustard are a great change of pace when it comes to flavor, especially when compared to those boring (inedible) mayo- and egg-based potato salads. Puppy Chow is one of those classic desserts that almost everyone loves, particularly because it's sweet and crunchy, and chocolaty and peanut-buttery. And, since it's a dessert that most people are familiar with, sharing it will give you a good opportunity to show that vegan desserts taste just as good (if not better) than their non-vegan counterparts. 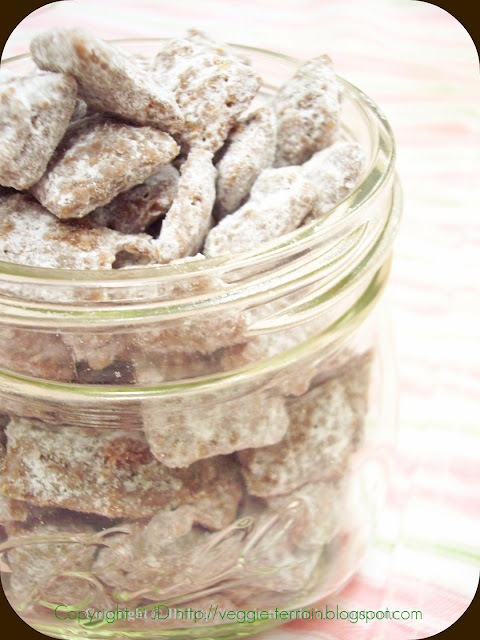 Moreover, Puppy Chow is a great dessert to make if you're traveling for the holiday - just throw it in a ziplock bag and off you go! In my family, Thanksgiving = pie. Unfortunately, however, the pies that're brought to dinner aren't exactly vegan-friendly, which is likely to be the same case at your gathering. To remedy the "I can't have dessert" problem, simply whip up this blueberry pie and bring it along to dinner so that everyone can enjoy a piece of pie. 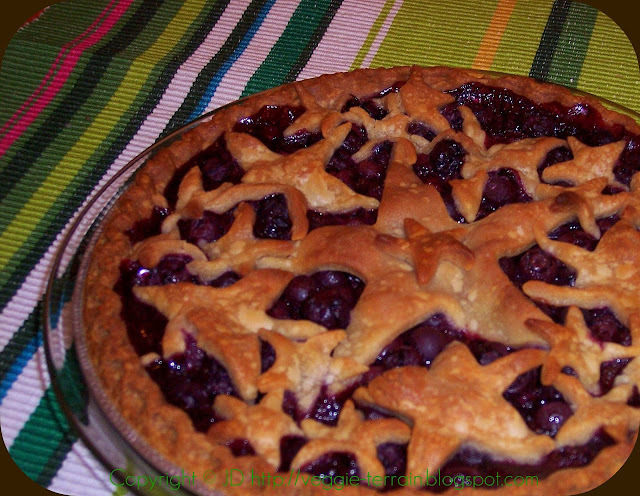 Although it's a lot of fun to make the "starry" crust, feel free to create a more seasonal pattern (or a lattice top) for the pie if you want. 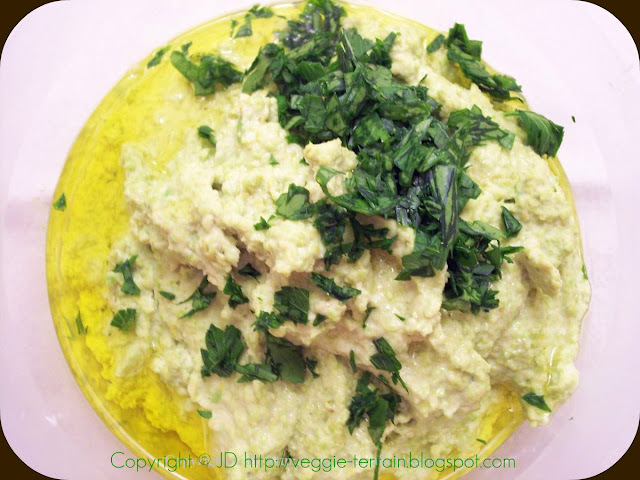 Dips are always great for holidays, especially when they're made of edamame and are in the form of hummus! 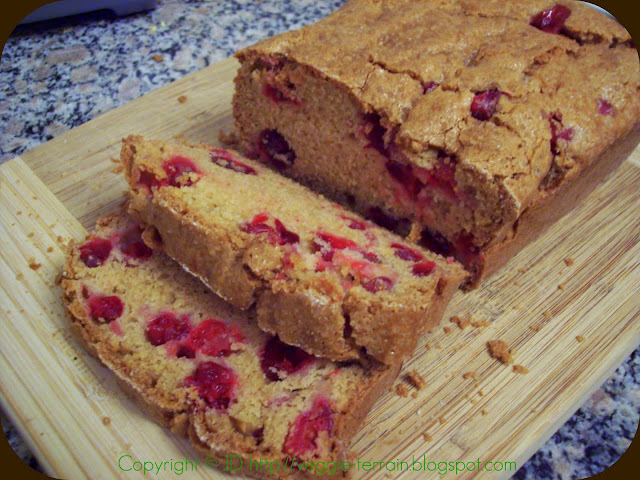 This recipe is wonderful for Thanksgiving, as it's easy to make and goes with almost anything. Try using it as a dip for pita chips, potato chips, or raw veggies - it even tastes great spread on slightly toasted bread as a variation on bruschetta. This is one of my all-time favorite salads (in fact, I'm planning on making it for my family this year). 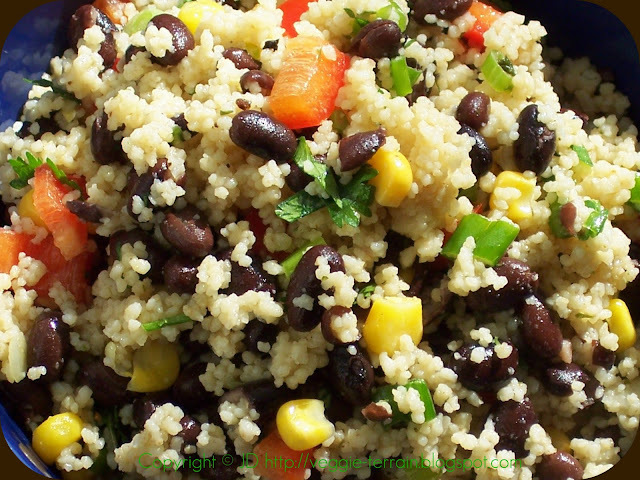 It's light, fresh, quick/easy to prepare, and is packed full of healthy, delicious ingredients. Furthermore, it's great for Thanksgiving because it can be served at room temperature, which means that you can save your precious refrigerator space for things like Pumpkin Cheesecake! 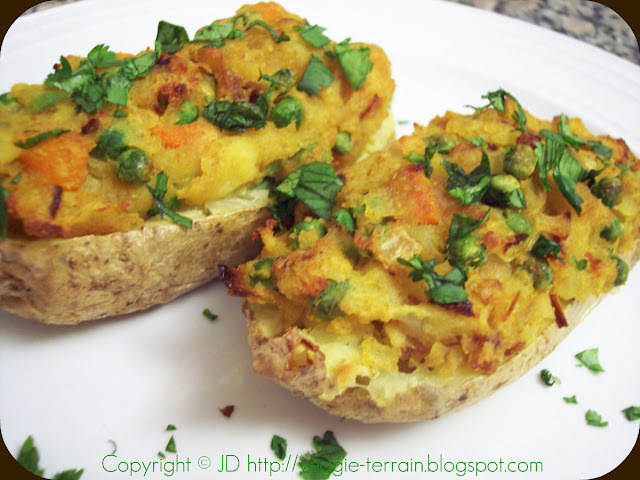 These potatoes are the perfect alternative to your typical Thanksgiving baked potatoes. The spices in the recipe give the potatoes a bit of an Indian flare, and I love how they allow you to enjoy the tasty flavor of a samosa (without all of the fuss of actually making samosas)! Serve these for Thanksgiving when you're looking for something that's familiar, but with an unexpected flavor twist. The buck stops here. Well, my dessert buck does, anyway - and I'm not even a big dessert person! However, this is by far one of the most scrumptious desserts that I've ever made, and everyone who's been lucky enough to try it agrees. (Sorry, no modesty here!) 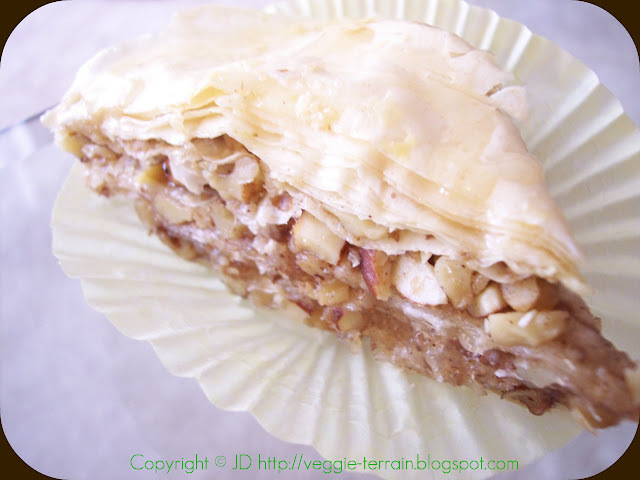 If you want to impress the hell out of everyone, take a few hours - this is a pretty involved recipe - and make this decadent Oh Baby, Baklava. It will definitely remind your family/friends what they should be thankful for on Thanksgiving: you! This food all looks fantastic! I was hesitant the first time I made cheesecake with tofu but it passed with two thumbs up from my husband and son. Another hesitation of mine was the chocolate mousse recipe from VCTOW, but I swear to you no one can tell it's made with silken tofu. All these recipes look so festive! I didn't cook this year, but I would have enjoyed all of these dishes. oh, so many lovely things, including the cutest pie ever. i've never seen that done before! first and foremost i'll be making the samosa stuffed baked potatoes, but i'll have to wait for christmas when i'll be getting my own copy of veganomicon. this cookbook is at the top of all other cookbooks on my christmas list, so excited!! love your site, i'm adding you to my reader and i'll come back to visit soon! 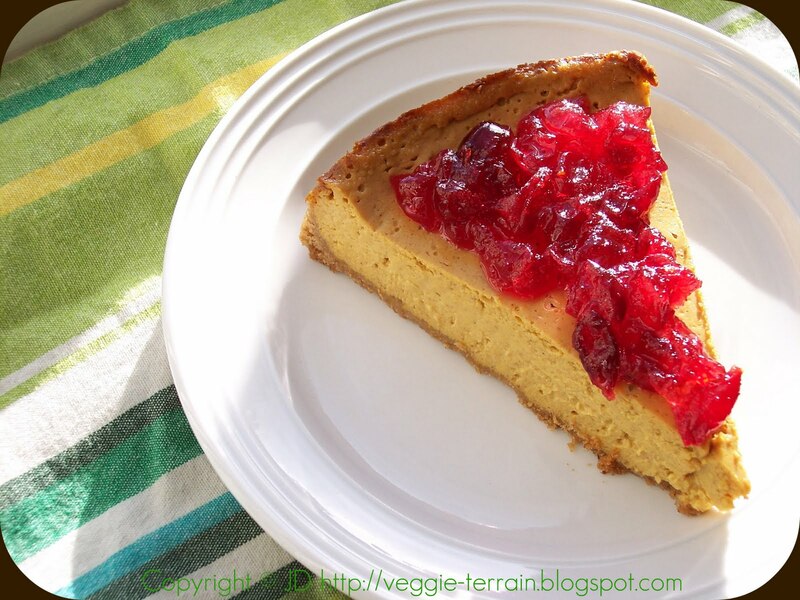 pumpkin cheesecake looks wonderful! Samosa filled potatoes is an interesting idea! I love samosas. My first visit here. You have such delicious looking and Fantastic food here and I appreciate your Top 10 as it introduced me to your blog. I esp love the chickpea tart. I'll be making that for sure.